Hadn't seen this posted here and thought it would be of interest to alot of you. I had the first 3g phone sprint had years ago and there was a $10 upcharge on the plan just to have the phone, so I don't think its without precedent. That said, I hope they don't charge extra for it unless you use the hotspot feature, which i don't see myself using a lot (who knows though once its an option how much i'll actually use it). Right before the rumored iPhone release date! Perfect time to take Apple's thunder! like the pre did? fail. The pre had no advertising before its release. At least Sprint customers or potential Sprint customers who have gone on their site have seen it. I expect TV commercial adds with it on the screen (maybe not a direct reference to it) to pop up. But yes, I agree in this case, Earlier is better and not really announcing a release date until you're close to it is a smart move on their part. 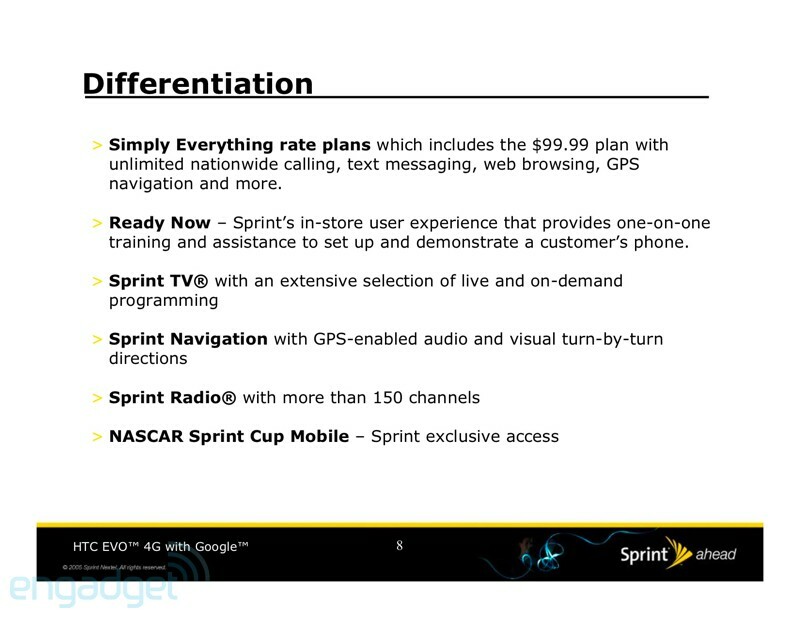 When I was at the Sprint store the other day there was a 3g/4g pricing brochure and the price was the same for both. The 3g had a cap on downloading capacity but the 4g did not. The salesman stated that it was because 3g was 'crowded' from all the use and they are trying to get people to switch over to 4g. Even though it is not available everywhere.. FWIW..
Upcharge for 4G? Not cool. Now if it turns out to be an extra $10-$20 for the hotspot, that doesn't seem unreasonable...though its free on the Pre+ at VZW. Now the June 13 launch date would be perfect...not too far away...but long enough that the webOS early adopters can make the switch. Not that I like rumors but I was talking to a BestBuy Mobile employee in Colorado Springs last night about the Evo. He, like me, has the Plam Pre and is going to get the Evo when it comes out. He said he has already been to one training class for the Evo and is going for a final class on the 14th (I assume he meant April 14th). He seemed totally excited about the Evo and said that he thought the price would be $299 for 2 year price - no MIR... :-O I don't care though since I still plan on getting one. He also reiterated that it would be out in June and that since I am a 1st day Pre buyer, I would be eligible for my upgrade when the Evo is released (I actually set up my Sprint account on June 1 so my Pre purchase would be easy)! He said the screen was beautiful and that they would have a working model. There was no reason to not believe him and it made me more excited about the phone. I can't wait, and hopefully I won't have to wait too long into June. Cheers to the rumor-mill. not to be a buzz kill, but i think thats fake. Why do you say that? There are several other pages of this info from engadget. I have a Palm Pre' and love my phone but I can't wait to pick up this phone... I just wish Lousiville had 4g. Same here, coming from a Palm Pre and looking forward to the EVO! And with all the financial woes at Palm who knows what will happen with WebOS in six months to a year. Soon, that won't be my worry! Engadget updated their post. Their insider stated that the hotspot will be extra not 4G. Let's hope not. Now that Verizon has made their Pre-based (others?) hotspots free, Sprint needs to follow suit, or risk losing more to Big(deal) Red. The hotspot may be free but your still paying more for voice+data then Sprint. The hotspot may be free but your still paying more for voice+messaging+data then Sprint.